Our new website is now live with a new look and lightning fast technology. It’s now even easier to plan your journey, change your ticket, top up your Smartcard, and easier to find times and fares. No matter what device you’re on – mobile, tablet, laptop or desktop – you’ll have better access to all our online services. 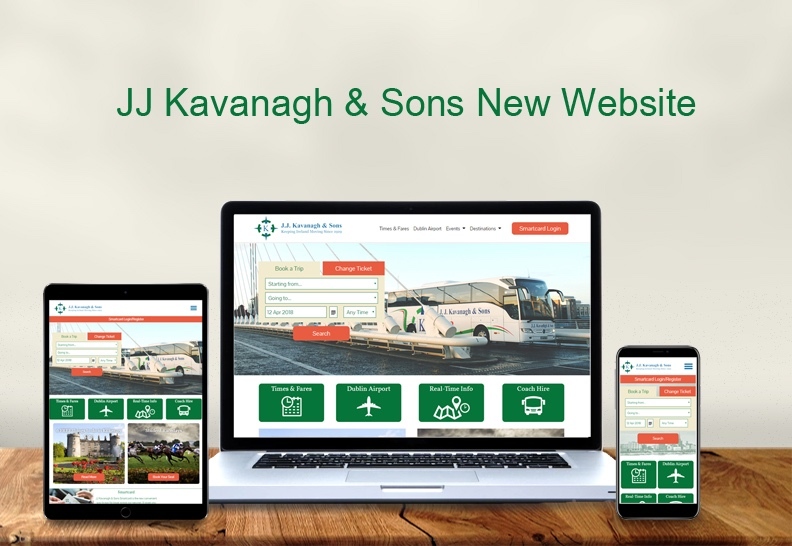 Why not be the first to take the new JJ Kavanagh & Sons website for a test drive? We’ve redesigned the site to make life easier for our customers. The new website features a simplified booking experience, enables customers to choose from over 180 destinations, and an improved blog to give you amazing travel inspiration. However, our favourite new feature is the change your ticket functionality!! This new feature will allow JJ Kavanagh & Sons customers to change the time and date of their web ticket, 24 hours prior to their journey. There will a small fee of €3 to amend your web ticket. You simply need the reference number (which is located under the QR code on your e-ticket) and your email address (that you booked your ticket with). You can use our new ‘plan your journey’ tool – while you are on the go! It will allow you to check the times and fares for your next bus or plan your next journey in just a few steps. The site is designed to be mobile friendly so you can book your bus seat in few easy steps. You’ll find all the information you need to plan your next journey, with the new, easy-to-use site design. A combination of the times (departure & arrival) and fares are all now in one place. The new design will make it registering for a new Smartcard a lot easier. You can also login quicker and Top-Up with Travel Credit or buy your weekly ticket within a few easy steps!